"HI-YAH! STOP!" Og commanded as he held aloft his strong, hairy hand. "Look you, Big Tooth! Tracks! Here in the soft earth. See them, Ru?" The Cave Boy and the Flat Head leader halted abruptly, their eyes following Og's pointing finger. Then all crouched down to examine the telltale impression in the soft earth. There were tracks, a lot of them. Human tracks. Many great-footed men had passed this way, traveling across the far-flung flat stretch of tundra that reached away northward as far as the eye could see. A band of travelers had slogged through the broad, marshy glade that reached a long arm across this flat land, and that band must have been the Red Beards Og and his friends were following; the Red Beards who had undoubtedly captured their good companion Tao, and were spiriting him off toward the North; toward the Red Beard village of old Lost Ear. "Whoo! Them be Red Beards for sure," muttered Big Tooth as he surveyed the track. "Them have plenty big feet. Not wear shoe clothes like Og teach Flat Heads to wear." "Aye," agreed Ru, "And I do not think it was long ago that they passed this way. See here." He pointed to one of the tracks as he spoke. "This is in marshy ground, and yet that track has not had time to fill with water since it was made. This day I think those Red Beards crossed here. At sunrise maybe. What think you Og?" Og, still studying the tracks, heavy brow furrowed, nodded thoughtfully. When he spoke again it was in a half whisper. "Aye, Ru." he agreed. "It was not long ago that these tracks were made. The water comes up through the mud quickly, but yet some of these tracks are not filled. We have been closer on the trail of these Red Beards than we thought. Almost I could believe they were in this long, dried grass just ahead. Make no noise, and stay crouched where you are. I will try to look above the grass and see if I can see any other signs of them." Ru nodded, and Big Tooth grunted in agreement, but they stayed crouched as Og slowly and very cautiously rose to his feet, the handle of his stone axe clutched grimly in his big fist. Higher and higher he rose until he stood erect. Only then could he see across the tops of the tall, softly waving stalks of sun-dried grass, and the low scrubby growth that clothed this vast, flat area. But hardly had he begun to scan his limited horizon before he became sickeningly aware of a soft movement in the tall grass to his left. At the same time there was a swirl of plumy grass tops to his right and a soft swishing sound behind him. Then suddenly an ugly, bearded face and a great fist clutching a stone axe rose up almost in front of him. At the same time heads began to show on either side and guttural yells sounded. Like a flash Og realized that they had indeed been following close on the Red Beards; far too close and too eagerly, for they had blundered into an ambush there in the long grass. They had walked into a trap. They were surrounded by the enemies they had been pursuing. "Hi-i-i-i-yah!" he yelled half in alarm, and half in anger. "Red Beards! They are here! All around us!" BUT he did not need to yell to warn Ru and Big Tooth. 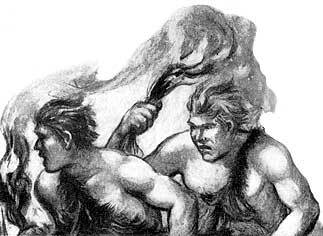 Even as the shout echoed from the Cave Boy's lips his two companions leaped to their feet, stone axes ready. "Whoo! Whoo!" grunted Big Tooth. "Plenty bad this. Run Og! Run!" "There is no place for us to run to. They surround us!" cried Og. "Fight is the only thing we can do; fight and  Look out, Big Tooth!" As he yelled Og leaped and swung his stone axe savagely at a towering Red Beard bearing down on Big Tooth. But even as he started the blow a great, long-armed, almost apish form leaped in from his right and seized hold of Og's stone axe as it paused for an instant above his head in the full arc of his mighty swing. Og, with an ugly grunt, tried to wrench his weapon free from the big hand that had closed about the stout axe handle, but even as he put all the strength of his powerful arms and big shoulders into the efforts, bedlam seemed to break loose there in the tall grass as a half dozen figures closed in and descended upon him. Red Beards swarmed over him. Strong hands seized his wrists, and forearms. Grim fingers closed on his throat. Great arms wrapped around his body and Og found himself set upon by a fighting, snarling mass of savage humanity. He was dimly aware that the same thing was happening to his friends. He could hear their yells and grunts of anger above the shouts of the Red Beards as they struggled against an overpowering number of these barbarians from the North, and he realized instantly that he and his companions were hopelessly outnumbered. That realization did not dull his fighting spirit, however. Grunting and snarling himself he struggled to fight off these powerful antagonists. Twisting, turning, wrenching, he broke their grips about his body. He got his arms free and began to lay about with closed fists, for his stone axe had been wrenched from his grasp. He clawed like an animal and even brought powerful jaws and strong teeth into play when one of the surging bodies closed in to grapple with him. He sunk his teeth into the thick neck of one man and bit deep until the taste of blood was in his mouth and the man wrenched free of him with a howl of pain. He clawed at the ear of another antagonist and all but tore it from the Red Beard's head. He gouged at the eye of another one and hooked his fingers into the curling red hair on the chin of still another dragging the man down to earth with him as the sheer weight of his attackers felled him. There, flat on his back he fought like a cave tiger, kicking, clawing, ripping and gouging as he yelled savagely by way of frightening his adversaries. But his yells did not last long once he was prostrated on the ground, for again grim fingers closed on his throat and bit deep into his flesh; so deep that his voice was throttled as the walls of his throat seemed to cave in under the pressure. Og was dimly aware then that the end was near. His mouth was forced open and his tongue bulged out under the pressure. His eyes felt as if they were being forced from his head and blood began to pound in his temples as he fought for breath and tried manfully to rid his throat of those punishing fingers. But that throttling grasp was too tight. His vision became a red blur in which ugly faces swam detached, yelling and leering at him. Then the red began to fade to black; a heavy muffling black that seemed to close in upon him smotheringly. Consciousness left him then, but still he struggled fiercely, savagely, with his waning strength until suddenly he went limp. Only then did that horrible pressure ease up on his throat and those grim fingers relax their grasp, but Og was not aware of the releasing pressure. He was unconscious. IT HAD been their anxiety over their companion Tao that had brought Og and Ru and Big Tooth so far north of the caves of the Flat Heads. Tao had wandered into the forest beyond the Flat Head village following the birds to watch them as they ate. It was Tao's way of discovering new foods. He realized that the birds, through some instinct they possessed which human beings had not, knew which was good and which was bad fruit. They could tell without an error which berries were poisonous and which were not, and Tao by watching them gained this same knowledge. He sampled all the things that the birds ate and if he found them good, he brought them back to the village. If he found them unpleasant he mentally marked them as worthless. He had been interested in grains, the seeds of the tall grasses, and he had journeyed far north toward the tundras, which was Red Beard country, in search of new foods, and had not returned to the caves when he said he would. The fact that he did not come back when he promised disturbed Og and Ru and Big Tooth, and after waiting the passing of as many suns as Og had fingers on one hand the three of them had set out to find Tao. They had picked up his trail and followed it deep into the cold country to the edge of the vast grass-grown plains. There they found a camp that Tao had made and there too they had found unmistakable signs of the fact that a hand of Red Beards had fallen upon him and taken him prisoner. 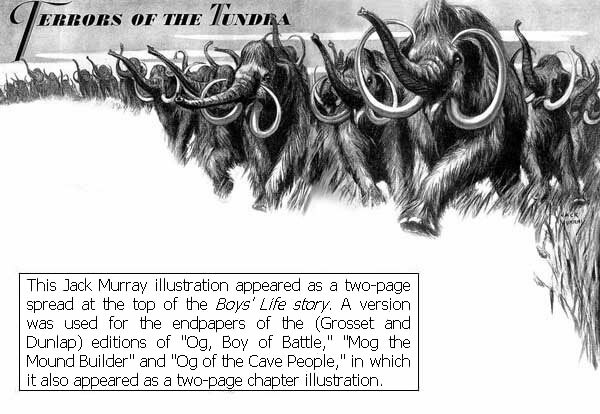 They followed a broader trail then across the tundras; a trail made by vast migrating herds of great hairy mammoths in their annual march north and south to avoid the increasing cold of a new ice age. It was this trail that the Red Beards were traveling and Og knew that if he and his friends traveled fast enough they could overtake them. But they had followed these barbarians from the North far too fast and too eagerly as it turned out, for they had overtaken them before they realized how close they were and had blundered into an ambush. AND now they too like Tao had been captured by these men from the Northland. Og became dimly and painfully aware of that as consciousness slowly returned to him after the savage struggle. He found himself lying on the ground in a big, tramped down area of tundra grass, flanked by some scrubby shrub growth. His hands arid feet were tied so tight with ropes of twisted grass that the strands bit into his flesh. Big Tooth and Ru, similarly tied, were lying nearby. Tao was there too, but he was sitting up, nor was he fettered. Indeed his attitude seemed to be almost that of a member of the party of Red Beards who were crouched around the carcass of a big ground sloth they had evidently killed with one of their sling stones and from which they were now hacking great chunks of meat with their flint knives. "Hi-i-i-yah," said Og in a half whisper. "Glad I am to see you here anyway, Tao. These Red Beards have not killed us, which they could have done. Why did they spare us, Tao?" "To kill us later, perhaps. At their village. These three suns I have been with them I have heard them talking of bewitched springs, wind gods, ice gods, snow gods, and fire gods. To some of these we may be sacrificed for they are full of fear, these people; even now they hurry across this great flat land because they fear the terror of the tundras," said Tao. A big, thick-necked, broad-shouldered Red Beard, with a crooked nose, got up from beside the dead sloth and with his stone axe in his hand approached Og, who had struggled to a sitting position. "So," he said in a guttural voice, "you are then this firemaker this one tells us about," he jerked his hairy head toward Tao. "I am Og," said Og, watching Crooked-nose craftily. "It is my hope that they will want you to make fire, Og," whispered. Tao cautiously. "Look you how dry the grass is. And the wind is from the south. If we could get a wall of fire between us and the Red Beards"
Og nodded, for in the back of his mind had been growing the same idea. "I will make fire for you. But I will need the help of others. And my tools, too. Unbind our hands," said Og, as he motioned toward Ru and Big Tooth. Crooked-nose cut their bonds but not without the warning that deadly sling stones would bring them down if they tried to escape. Og was very deliberate about his preparations. First he examined the bow and tested the string. Then he examined the spindle, the chunk of hearth-wood and the stone thunderbird he carried. Then he motioned Tao and Ru and Big Tooth close to him, pretending that he needed them to hold the hearth board and to blow when the hot coal showed, but actually to whisper instructions to them. "Have torches ready to light when I give the word. When they are lit, scatter and light this dried tundra grass. We will build a circle of fire around these fellows. They will fear it, but we will plunge through and escape. Run up wind so the flames, will not overtake us. Plunge into the tallest grass to escape their sling stones. You understand"
Deeply interested, but a little fearful, the Red Beards moved back a pace or two and stood watching, some of them still chewing on hunks of the bloody sloth meat. And so thoroughly did the operation of fire making hold their attention that even the most nervous of Crooked-nose's men were not aware of a strange dark mass building up against the Northern horizon, a queer moving mass of great dark shaggy backs, huge heads, and curved, gleaming white tusks, the great herd of migrating mastodons moving southward. Og was not aware of them either as he bent over his fire tools and twirled the spindle with long steady strokes and made the point fairly sing as the friction heat mounted. When the whisp of blue smoke began to show and the hot little point of fire appeared, winking like a fierce eye, an exclamation of amazement went up from the Red Beards. "Fire," exclaimed Crooked-nose unbelievingly, "hah, this is magic. Here is a great witch-doctor. If"
Crooked-nose stopped talking abruptly as grunts of alarm escaped the other Red Beards. At the same time Og and Ru with Big Tooth and Tao leaped to their feet. Instinctively all looked off toward the northward, for suddenly across the tundras had sounded several shrill trumpeting calls, and a moment later a thunderous rumbling roar began to mount while the earth trembled. "Hi-i-i-i-yah!" exclaimed Og. "Look there. The hairy mammoths! A great herd of walking mountains"
Consternation gripped Crooked-nose and his followers. For a moment they stood there looking in terror at the great mass of heaving backs and massive heads with their upflung trunks and gleaming tusks. The mammoths had scented the presence of human beings in the long grass of the tundra. The wind had carried the odor toward them, and though their little eyes had not as yet seen the Red Beards and their prisoners, they were following the scent up the wind, their savage hate blazing high as they broke into a charge. "Whoo! Whoo! What we do here, Og!" exclaimed Big Tooth, "not can stop them fellow with stone axe or arrows"
"Nay, we can not," cried Og, "we are lost unless"
"The fire, Og! The fire!" cried Tao. "It will stop them! Build a wall of fire"
"Aye, It was my thought. Your torches of twisted grass are ready! Light them! Light them from our little fire, then set fire to the grass yonder. Build a line of flames. The mammoths will smell the smoke and see the flames! They will stop their charge"
And while the four boys from the caves worked manfully to build their barrier of flames and stop that oncoming herd, Crooked-nose and his Red Beards watched them with anxiety on their faces. For a time none of them attempted to help, for they feared the fire almost as much as they feared the charging herd of mammoths. But when Crooked-nose began to realize what Og and his companions were doing and when he saw with what little fear they handled their flaming torches, he, too, twisted himself a bundle of dried grass and began to spread the fire line as he saw Og doing. The smoke and crackling flames slowed down, then brought to a full stop the thunderous onward movement of the great herd and as the billowing yellow pall rolled skyward, shot with snarling tongues of red, the trumpeting challenge of the great beasts changed to squeals of alarm and terror. Ponderously the leaders of the herd began to turn and mill around to get away from the flaming terror that the wind carried toward them. "Whoo! Whoo!" grunted Big Tooth. "We not worry about them fellows now. That danger be past." "Aye!" said Ru. "But we are still prisoners of the Red Beards." "But if we move fast we need not be," hissed Og. "See, still most of them spread the fire across the tundra while the rest just stand there staring in fear at the flames. Come. It is our chance to get away from these men from the North. Grab your weapons there and plunge into the long grass. Travel southward fast for it is not too safe for us to stay near this fire wall. The wind may change and then we would be in danger. Follow me!" And sweeping his bow and arrow and stone axe up from the ground where the Red Beards had left them, Og melted into the tall tundra grass and disappeared while Ru and Tao and Big Tooth followed him.